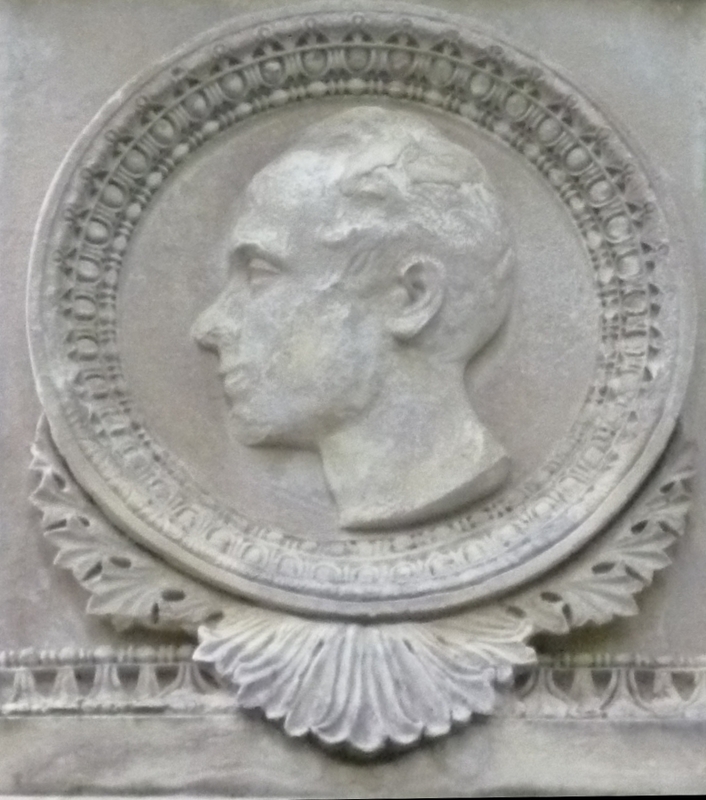 Medallion on Giovanni Bellini's headstone, by Baron Marochetti. 1835. Père LaChaise cemetery, Paris. The Sicilian opera-composer Bellini, who died tragically young at the age of thirty-three from (most probably) amoebic dysentery, was described by one important French publisher as "blond as the fields of corn, sweet as the angels, young as the dawn, melancholy as the sunset" (qtd in Willier 21). Marochetti has caught the sweetness of his expression beautifully. Bellini was an ideal subject for a sculptor with both an Italian background, and a Romantic turn of mind (see Ward-Jackson). Left to right: (a) Front of the whole headstone. (b) Names of cities inscribed on the headstone. (c) The headstone in its setting. 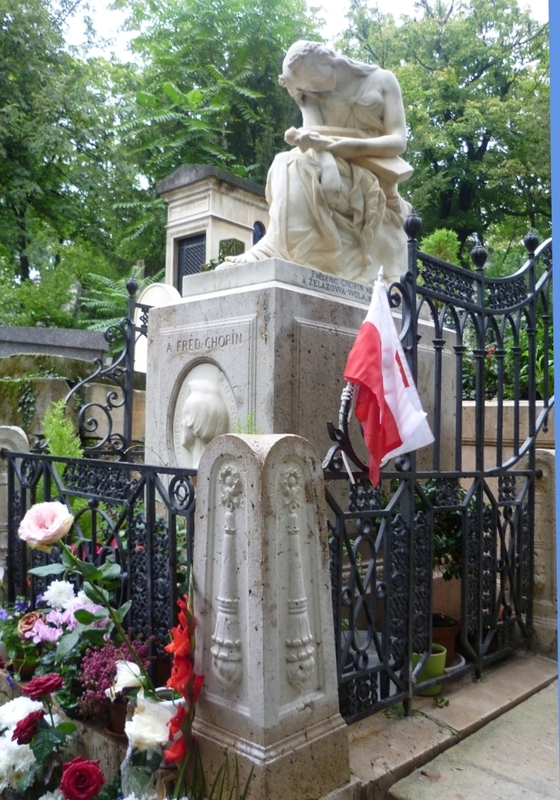 (d) Chopin's tomb nearby. Marochetti's commission was an important one: such was the standing already achieved by Bellini that his funeral was "attended by the most noted musicians and artists in Paris" (Willier 7). 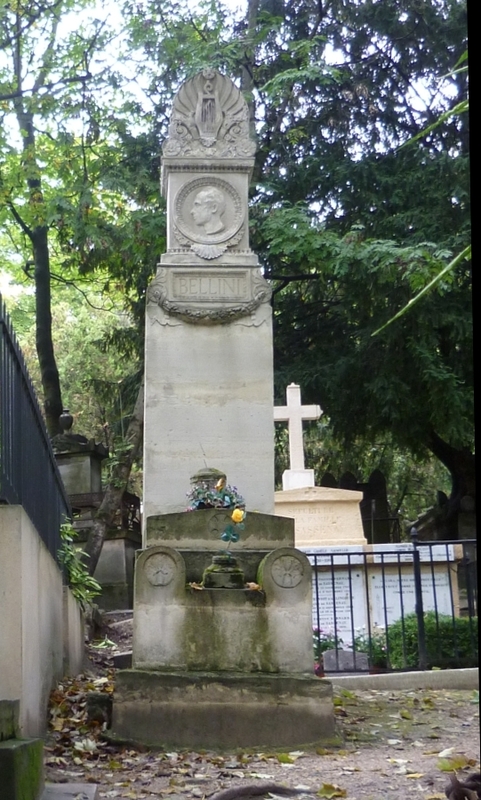 One of the myths surrounding him was that Chopin had expressed a wish to be buried near him; and indeed, it may not be a coincidence that Chopin, who loved opera himself, and had met Bellini in 1830, was laid to rest close by (see Willier 197). 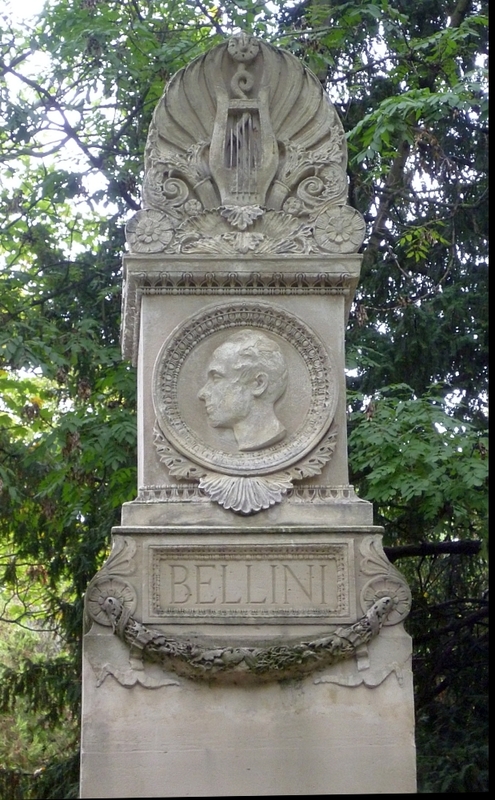 Bellini himself is no longer buried here. His remains were removed to Catania Cathedral in 1876 (see Willier 8). Ward-Jackson, Philip. "(Pietro) Carlo Giovanni Battista Marochetti (1805-1867)." Oxford Dictionary of National Biography. Online ed. Web. Viewed 15 October 2012. Willier, Stephen Ace. Vincenzo Bellini: A Guide to Research. London: Routledge, 2002. Print.